Currently, the infobox takes just the half of the available screen width, which looks like there is pretty much unused space. 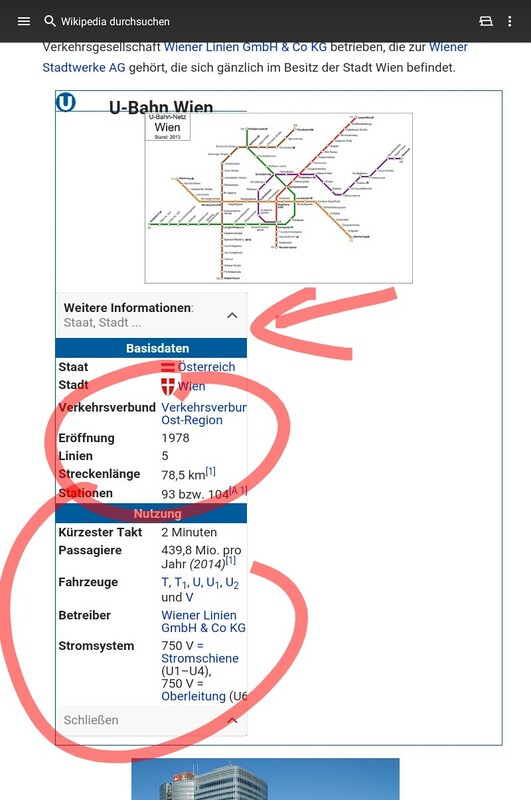 Isn't it possible to use the complete screen width or at least center the infobox, so it doen't look so much "misplaced"? Florian added a project: Wikipedia-Android-App-Backlog. Dbrant added a subscriber: Dbrant. These kinds of issues can now be reported to MobileFrontend, or fixed by boldly editing the offending article. • Jdlrobson added a parent task: T133410: Deploy TemplateStyles to WMF production. • Jdlrobson added subscribers: Jdforrester-WMF, Nirmos, Mholloway and 18 others. The infobox is inconsistent with other infoboxes. It's a div not a table. There is a float-right class and many inline styles. These are very difficult to reliably hijack. TemplateStyles will help here when available. This will need to be fixed on wiki. • Jdlrobson moved this task from To Triage to 2014-15 Q4 on the Readers-Web-Backlog board. Jdforrester-WMF added a subtask: T133410: Deploy TemplateStyles to WMF production. Agreed, this needs to be fixed on the german wikipedia. This is not a proper/standard infobox.